A sparkly, sugar–coated, and underwhelming 92 minutes. The Aftermath is a poorly recycled rendition of Romeo and Juliet that tastelessly uses World War II as its backdrop. George R. R. Martin has officially exited the room. .Paak seems to have learned a few things since Oxnard. A campus favorite, Honest Tom's is starting to educate consumers about infusing THC and CBD into meals. Whether it's an impulse pixie cut or quarter life crisis highlights, we can all learn to embrace change. Enjoy the nice weather with these events around the City of Brotherly Love. Street: Who are you, and what do you do on campus? Maxwell Presser: My name is Maxwell Jonathan Presser—and I say that whole thing for a reason. I’m a senior in the college, and I’m majoring in Health and Societies, minoring in Korean language. I’m pre–med, I’m a Benjamin Franklin Scholar, and I’ll be graduating with fifty credits… so I’m really all over the place right now! Street: Okay, so why are you “Maxwell Jonathan Presser”? MP: My legal name is “Maxwell Jonathan Presser,” but when I was born my name was “Jonathan Maxwell Presser.” When I was six months old my mom said, “I don’t like the name ‘Jonathan.’” So she had my name legally changed to “Max Jonathan Presser.” So I grow up, and I’m 16 years old, and I’m at my brother’s college graduation, and they’re announcing all the doctors. I always knew I wanted to be a doctor and I thought that “Dr. Max” sounded stupid. So I had my name legally changed a second time to “Maxwell Jonathan Presser.” It gets complicated. But Maxwell is my formal name. Street: What’s your least healthy habit? MP: Probably eating. I probably eat Chipotle and Greek Lady one–and–a–half times per day? Then every once in a while I panic because I realize I haven’t touched a vegetable or a fruit in four days, four weeks. You never really know. Street: You’re known in Sphinx as “Chief Chief.” What fictional or real leader do you align most with? MP: I would say Scooby Doo. There’s always something going on and he always figures out what’s going. There’s a lot of stuff going on in this school, and in this world, and I wanna figure out how to get to the bottom of it. Also, I could literally eat 40 packs of those gummy Scooby Snacks. Street: Who’s your alter ego? MP: I would definitely be a Korean pop star. It’s the hair. And the smile. Street: What does MERT stand for? MP: The Medical Emergency Response Team. Street: What else could MERT stand for? MP: Hmmm... Messy Eaters Reviving Twerkers? Street: What’s your theme song? MP: Maybe a little Avril, maybe some Nine Inch Nails… I’m a little angsty underneath. It’s a little angry, but it’s okay to be angry. It’s okay. 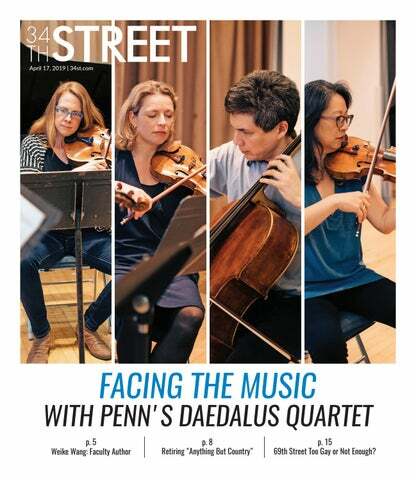 Street: There are two kinds of people at Penn… MP: Those who talk and those who do. Because I hate talking, but, most of the time, I want to actually do. And I want other people to do that, too. Stop talking and just do it. Street: What’s your secret talent? MP: One of my friends at camp used to be able to stick spaghetti up his nose and cough it up out of his mouth, and he taught me how. You just have to lick it a little bit, and snort it up your nose, and cough a little—it comes right out. Street: My PennCard looks like _______. MP: Naked. Well, my card looks naked. I swipe in the quad all the time and it took off all the film. Street: You’re also a CPR instructor. If you could give mouth to mouth resuscitation to anyone, who would it be? MP: This has actually come up before in other interviews. Megan Fox just because, imagine how she even got into that situation. It’s going to be so absurd. Street: What’s your spirit animal? MP: A sparrow. My duckface is notorious—snapchat would take hours out of my day… literally. But there’s a new duckface that’s all the rage in Japan—it’s called “The Sparrow.” You have to open your eyes really big and open your mouth a tiny bit, like you’re waiting for your mommy bird to feed you a worm. It’s the new rage. It’s coming. Street: On any given night during Halloween, how many calls does MERT get? MP: A lot. A lot. Probably around 10 for each of the weekend nights. Street: What are your safety tips for Penn students over Halloween? MP: Wear shoes you can walk in. Because if you fall, that’s no good. On the same note, keep your shoes on. No one likes glass in their foot. Also, don’t take candy from strangers. Trick–or–treat safely everyone!